This is a sponsored post written by me on behalf of Huggies. As always, all opinions are my own. If there’s one thing we know (and my boys love) in my house, it’s mess. In fact, with a family of four boys, we have just embraced dirt and chosen to make it work in our house. Our carpet, walls, and couches are all the color of dirt. 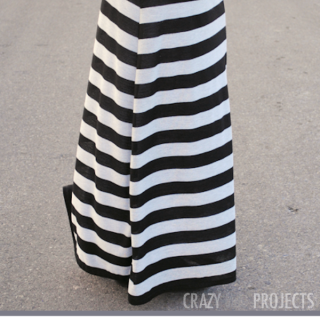 Makes it easy to hide the messes. But you can probably guess that there is still plenty of mess that happens here and my boys like to get dirty! 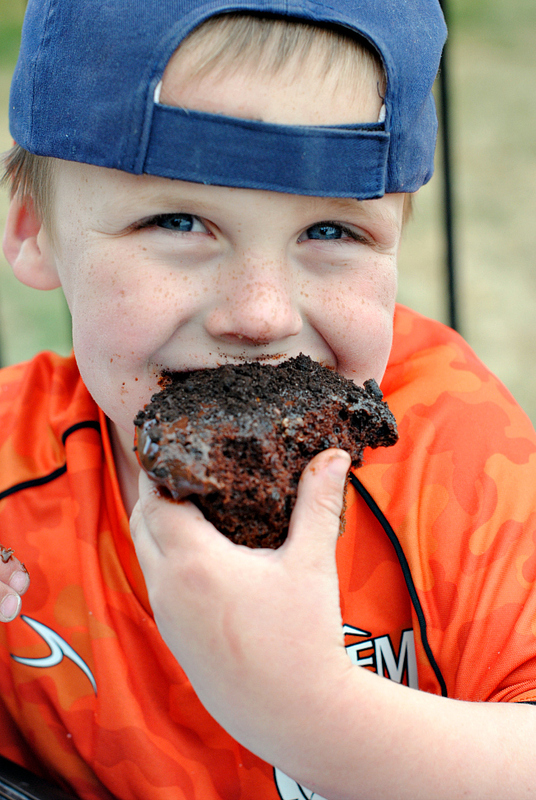 To embrace the love of dirt, my boys and I made some fun Dirt Cupcakes with Chocolate Ganache and Cream Filling! Fun for them-tastes great to me-Win Win! Fun for Earth Day or any day-kids love these! 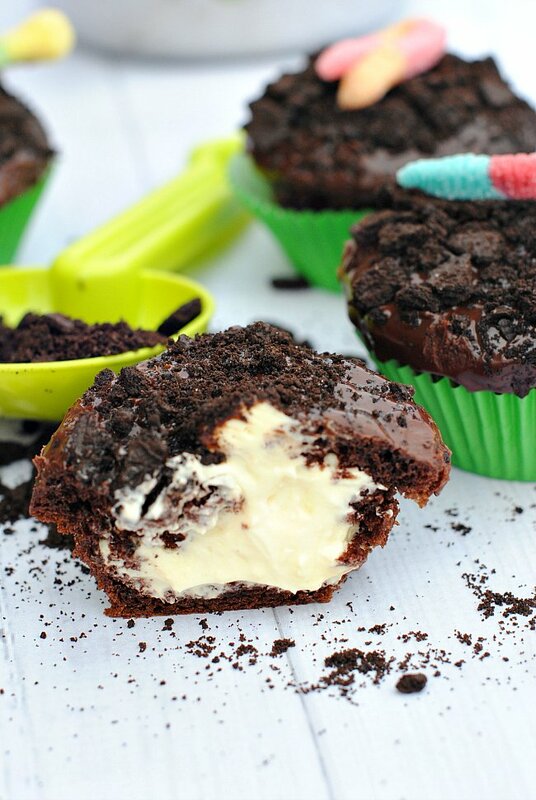 They’re a cute cupcake that looks like dirt but tastes great! 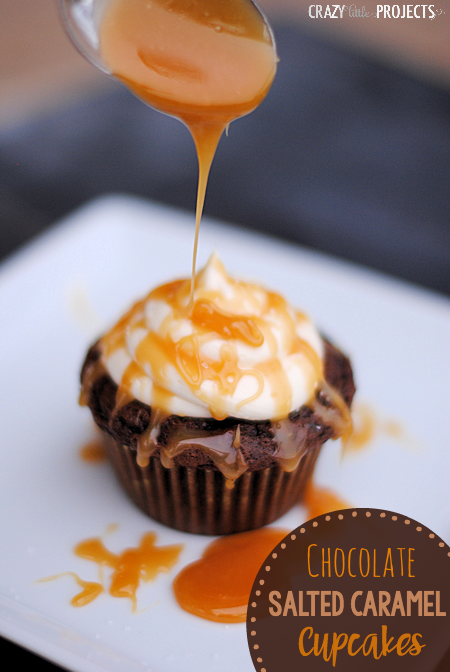 Chocolate cupcake filled with a creamy mousse filling and topped with chocolate ganache and crumbled chocolate cookies. Add a little gummy worm to make it extra fun. The kids love that! In fact, I had about 6 little boys (we had friends over) surrounding me and waiting anxiously while I finished because they couldn’t wait to try them. And not only do they LOOK dirty, they get pretty messy! My hands were covered in chocolate and so were my kids’ faces by the time we were done. That’s ok though, I embrace the mess. 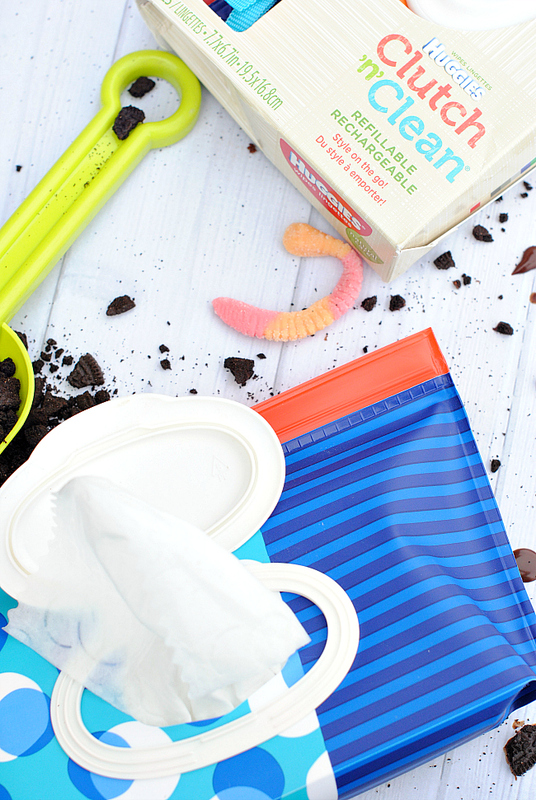 And clean it up easily with the Huggies® Wipes that I keep on hand for just this kind of thing. Seriously-so handy to just be able to wipe it up quick and easy! 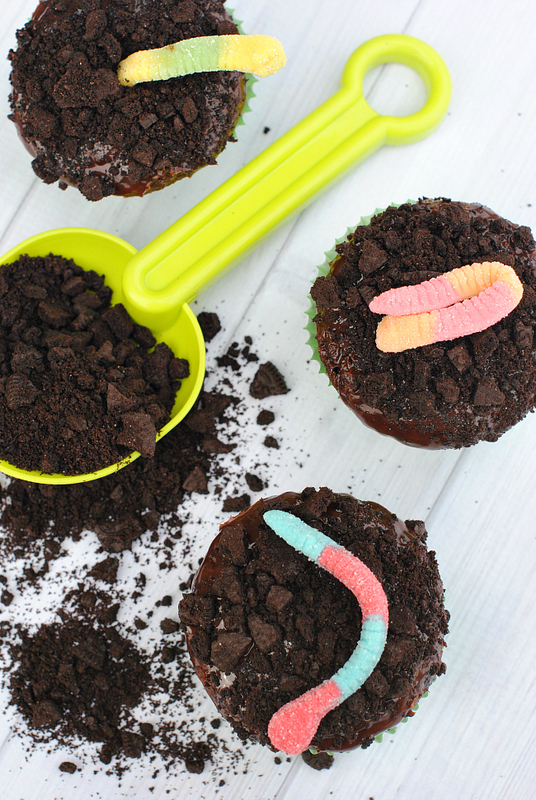 Let’s talk about how to make these fun little dirt cupcakes-because your kids are going to love them! Combine the above ingredients and mix until smooth. The batter will be fairly thick. 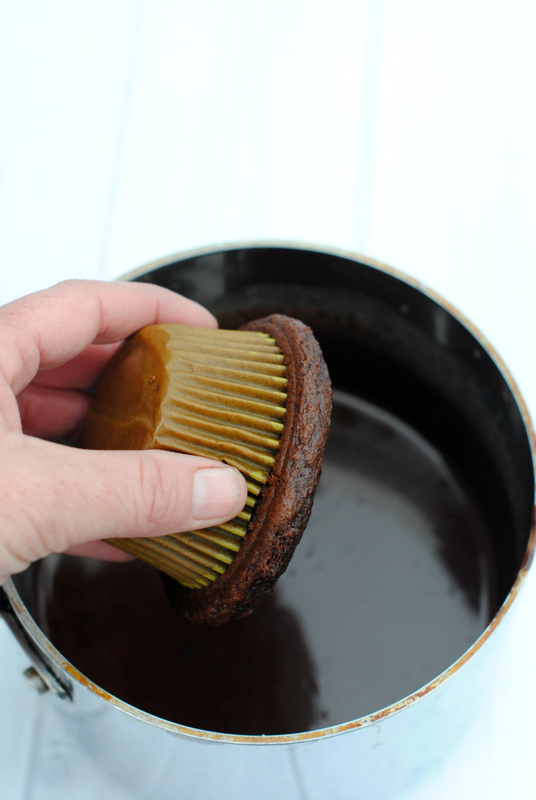 Spoon into 24 paper lined muffin tins. Bake for 18-20 minutes (always err on the side of shorter-I do 18 minutes exactly) at 350 degrees. 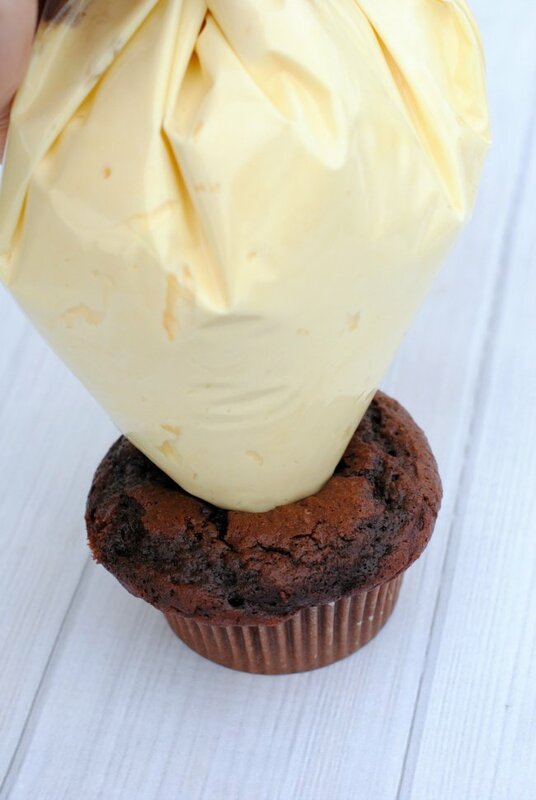 Blend pudding mix, cream cheese, margarine, and milk with electric mixer. Fold in cool ship till just mixed. Heat cream in a pot on the stove over medium-high heat till barely boils. Melt chocolate chips in. Set aside to cool at least ten minutes. 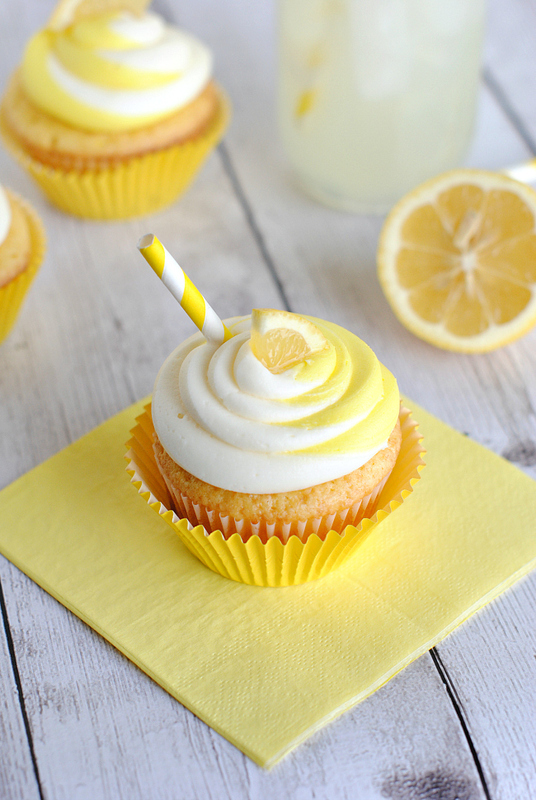 OK, let’s assemble the cupcakes! 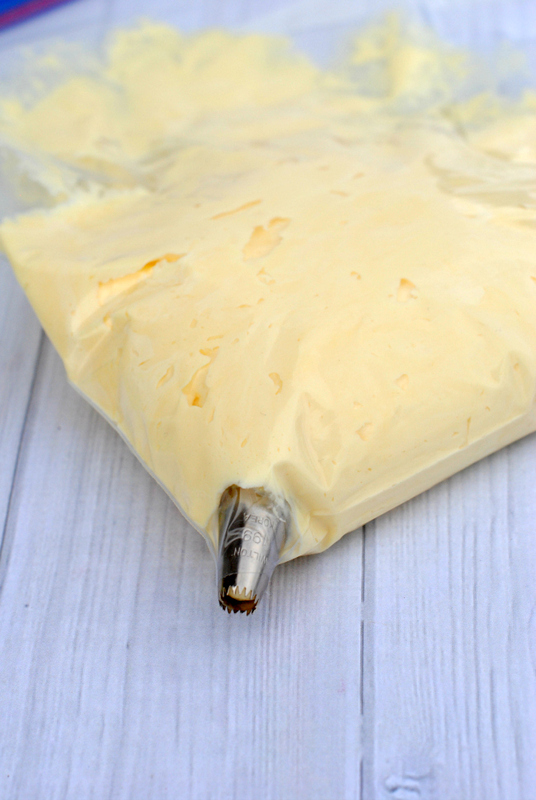 Snip a small bit off the corner of your Ziplock. Put your decorating tip in that corner so that it sticks out the hole. Fill the Ziplock back with your cream filling. 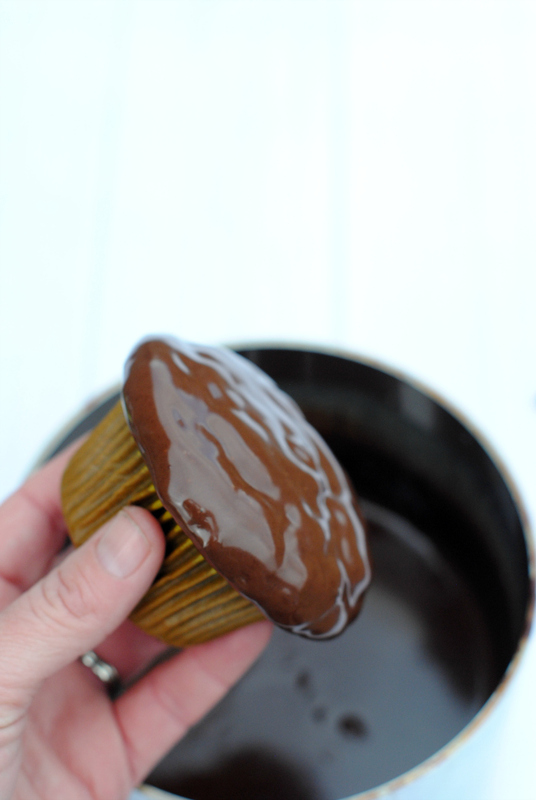 Stick the tip down into the cupcake and squeeze gently to fill the cupcake. Squeeze for about 3 seconds. Sprinkle with crushed chocolate cookies. 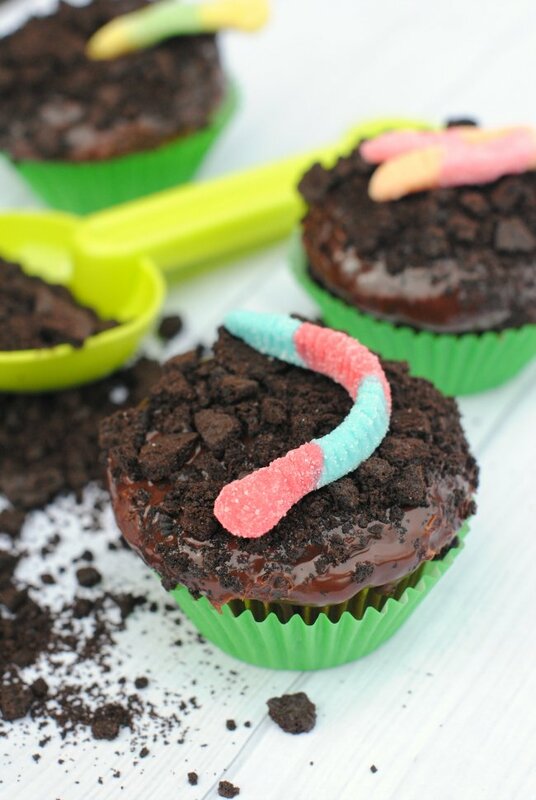 Top with a gummy worm and you’ve got a fun cupcake! And let them dig in! Don’t worry about the mess! You can clean it up with your Huggies® Wipes. 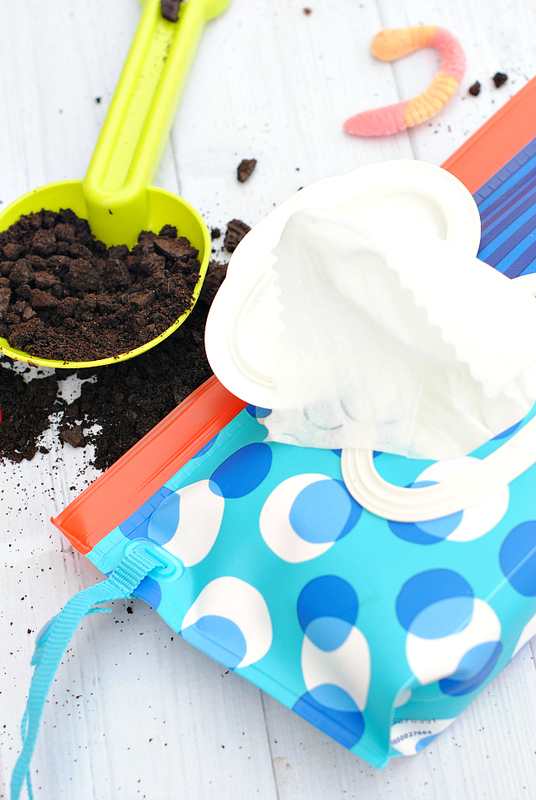 You can grab these wipes in other parts of the store now too-not just the baby section. I also keep a pack in my car to clean messes on the go! 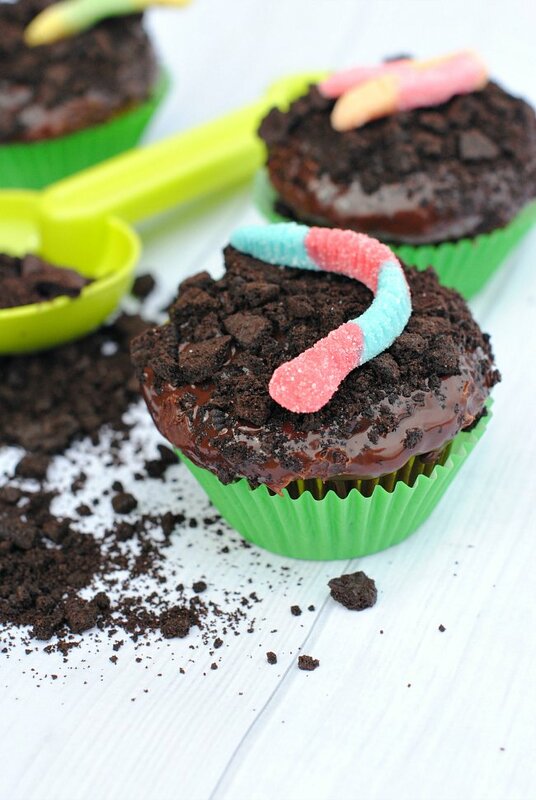 Enjoy these yummy dirt cupcakes! Gotta love ‘dirt’ like this! When I was a wee girl, my dad settled me in the garden with a few new potatoes while he finished digging a row for the root cellar. When he was done, I presented him with a beautiful, gleaming white potato, a toothless grin lighting up my dirt encrusted face. I was so proud of my potato. There is an old saying that we will all eat a peck of dirt before we die. I wouldn’t mind eating my share if this is what it’s like. I know these will taste better than my potato. Yes, this would be the good kind of dirt to eat! I am sure we all eat plenty of the other kind too.